Hope, a painting by the young Afghan artist Fareeha Ghezal Yousufzai, on display at the 'Make Art, Not War' exhibition. It's a tree so withered and broken that only a single scarred branch is still struggling heavenwards. Yet all life has not gone: a tiny leaf, green against the cerulean blue of the sky, stubbornly clings to a twig. For the circle of burka-clad women huddling around the forlorn trunk in the hot, dusty sunshine, it is a sign of hope. 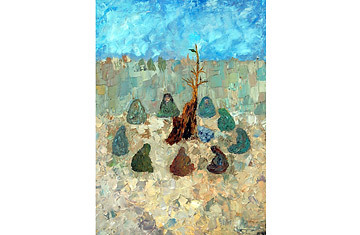 The painting by Fareeha Ghezal Yousufzai that depicts this scene is part of "Make Art, Not War," the first-ever independent exhibition of works by female Afghan painters outside the strife-torn country. On display in Bonn until September 9  after which it will move on to Austria, Italy, Spain, China, and the U.S.  this remarkable exposition is itself a symbol of hope, and not only for the 21 students from the Center for Contemporary Arts-Afghanistan (CCAA) in Kabul whose works it includes. In a place where Taliban rule had forced art into hiding, it's also, says Rahraw Omarzad, the institute's director, "the beginning of a new movement, an indicator for deep-reaching change in a new era and a new step in the life of the visual arts." Although the 16-to-27-year-old women have grown up in an isolated environment where the -isms of Western art were largely unknown or unaccepted, their work bears traces of impressionism, abstract geometry, abstract expressionism and even surrealism. Yet "the paintings retain their uniqueness through the freedom of choice of their creators, who learned different styles of painting and developed them," says Hamid Naweed, an art professor at Kabul University. "So the individual, original idea remains." While the lives of the CCAA artists were shaped by the terrors of war and oppression under the warlords, the Soviet and the Taliban, their creations are unashamedly exuberant and political. Often full of color and strong in contrasts, they speak of the desire for liberty, peace, and social justice  especially for women. "Shining even through that which is narrow and dark ... is the belief in the effect of artistic expression," comments Claus-Peter Haase from the Museum for Islamic Art in Berlin. "That is admirable." Take Maliha Hashemi's Regrets with its four roughly outlined, grey human shapes overarched by black. Like her other works, the 24-year-old explains, the painting "depicts my sympathy towards the deprived women of my country." Yet it does so with a positive spin: the top third of the canvas is dominated by a horizon of cheerful stripes in many colors. Hashemi hopes art will become a "means by which women can advance themselves." At least it has been one for her and her fellow-graduates: all of the women consider themselves full-time artists, and some teach at the CCAA. Far from luxuriating in l'art pour l'art, the women "understand their responsibility as artists neutrally and farsightedly as a political duty of enlightenment," says curator Eleonora De Saavedra. So the sordid or brutal realities the painters pick as their themes are never depicted too vividly or destructively: "The language of the paintings is not one of violence or debate," explains Saavedra. "It's color, light, a trace, a document of the hand [that made it], of the soul, of the individual." Today's Afghan women are still far from free self-expression, whether artistic or otherwise. But perhaps the unstinting efforts of young female artists like Fareeha Ghezal Yousufzai will help pave the way to more of it.